Home About Art Nature or Nurture the biological determinism debate. ‘Biological determinism versus cultural determinism’ is a bit of a mouthful. It is the same thing as ‘nature versus nurture’. This old and controversial debate is the subject of this blog. And how it applies to the art world in particular. In simple terms the two sides of the argument say that human behavior is determined by either inherited genes, nature, or by lifetime experiences, nurture. The debate is as old as the hills. The origins of nature versus nurture argument date back for thousands of years and across many cultures. The Greek philosopher Galen theorized that personality traits were the result of a person’s relative concentrations of four bodily fluids, or humours, namely blood, phlegm, yellow bile, and black bile. Hmmm!? But I suppose he was saying that our body fluids determine our actions. It was in our nature rather than something learned or nurtured. But a much later 17th century scholar, philosopher John Locke, is well known for the theory that children are born a “blank slate” with their traits developing completely from experience and learning. So his position was in favour of ‘nurture’. 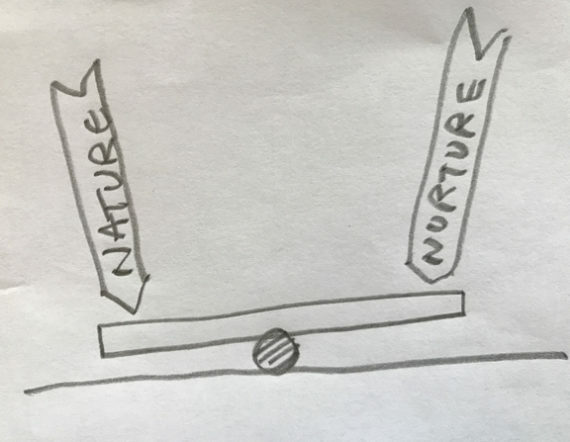 The actual term nature-nurture comes from Sir Francis Galton’s 1874 publication of English Men of Science: Their Nature and Nurture, in which he argued that intelligence and character traits came from hereditary factors. He was Charles Darwin’s half-cousin and evolutionary theory was a big factor. So Galton’s position was in favour of ‘nature’. Fast forwarding to the 20th century, the debate continued in pretty much the same terms. For most of the 1900s, the dominant school of thought, developed from the ideas of Ivan Pavlov and later Sigmund Freud, was behaviourism. This emphasized the importance of learning in shaping behaviour. In the mid twentieth century the existence of DNA in genes was established. The way that genes, nature, might influence our behaviour could be explained. Despite the fact that these two perspectives were often in fierce opposition to each other, both shared the view that the environment and a person’s unique experiences, i.e. nurture, were forces in development. Modern psychological thinking seems to favour a mixed influence on behavior with some tested results giving it a 49 to 50 percent result. It doesn’t matter which way round in case you ask. The result is more or less even. And not dominated by one side or the other. So how does this affect the way we view and act in the artworld? The nature perspective would argue that art is based on everlasting universal scientific facts and basic evolved human emotion and thought. That is how and why artists choose and use their colour palette, perspective, balance and design principles. And even why they choose their subject matter. While the nurture argument would point out that art is so very different in different times and cultures, therefore it is learned. If the nature argument dominates our understanding of art can be seen as fundamental and important because it reveals otherwise invisible huge forces of the natural world and that is why we latch onto and appreciate the message. If the nurture argument wins then we tell ourselves that art is culture. We can see that it has developed and changed over the centuries. We can also compare the differences between separate local and regional influences. The latest psychological results showing a 50-50 ish influence allow us to appreciate art and practice our art creativity with two major forces at work. It is not ‘either or’, it is both. We have twice as much explanation to help us get to grips with what art is all about. If we don’t accept that both forces are equally important we are missing out. Tell a friend or colleague about these blogs and discuss. Next articleCOPYING is it HOMAGE, PLAGIARISM or FRAUD?